Dublin take on Donegal today at Croke Park in the opening round of the Lidl NFL, it’s been nine years since Donegal last played in GAA headquarters and Karen Guthrie speaking at the official launch a few days ago expressed how much Donegal are looking forward to it. The game forms part of a double header with the Dublin men’s team taking on Galway later in the evening, it’s something Karen thinks is great for the game and nice to now have a closer working relationship with the men’s boards. “The LGFA have a huge push on this year and I think it’s brilliant and you have to have a good relationship with your men’s board to try to be open enough to let that happen. Last year’s All Ireland Ladies Football Finals drew a record attendance of over 50,000 supporters and although Karen Guthrie and her team wasn’t involved, but she spoke about how exciting that was for the game, her own experience of attending the 2017 final and how all players are benefitting from the upsurge in interest and attendance at the games. “Yes, it huge, its huge when you are watching it, we attended the 2017 All Ireland final. The buzz was just crazy, there is nothing like it. “For that to be a ladies’ game, to be one of the highest attended games in Europe it’s absolutely huge and it’s a testament to the work going on behind the scenes. With a nine year gap since their last appearance in Croke Park the Donegal team are buzzing for the game according to Karen Guthrie, but she also expressed that there is still a game to be played and besides the excitement of taking to the Croke Park pitch Donegal still have a job to do. “Yeah it will be brilliant we were just standing out there now and it’s just fabulous the buzz. “The Dublin girls are lucky as they get to play on it time and time again, they are probably used to it by now at this stage where it’s a whole new ball game for us and we are all really looking forward to it. 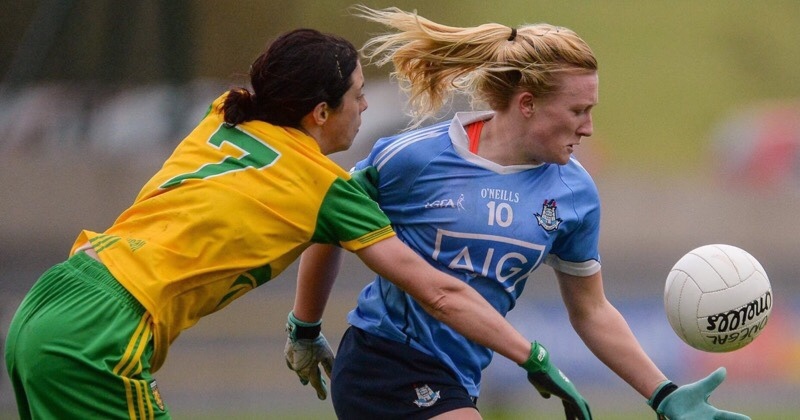 Even at this early stage of the season it’s still a formidable task to face the All Ireland champions and Karen Guthrie picked out what she sees as the main strengths that Dublin possess and the high standards they have set. “They are very pacey, the one thing about Dublin is that their basic skill levels are very good, the fundamental stuff is very important to them, their ball handling skills, their kicking skills and they are very clinical as well and everyone seems to be on a level – they have set the standard for the rest of the teams.